I was told I would never race again and that stayed with me. It potentially robs you of something in your life. Helping to spread awareness on the major diabetes epidemic, Mediaplanet today announces the launch of this June’s edition of “United for Diabetes.” This campaign will educate readers and their caregivers about the growing diabetes epidemic in California, educating one of the nation’s most at-risk populations, highlight the complications and risks that can occur when chronic diabetes goes untreated, or undiagnosed, and discuss when to get tested and how to manage the disease. More than 29 million Americans are living with diabetes, and 86 million are living with prediabetes, a serious health condition that increases a person’s risk of type 2 diabetes and other chronic diseases. For the cost categories analyzed, care for people with diagnosed diabetes accounts for 1 in 4 health care dollars in the U.S., and more than half of that expenditure is directly attributable to diabetes. But there is the potential to decrease the likelihood of adults developing diabetes with further research and development. Even so, there remains a noticeable lack of urgency from the government to focus on funding research for a cure, leaving patients and families continue to suffer through with little national support. The print component of “United for Diabetes” is distributed within today’s edition of LA Times with a circulation of approximately 450,000 copies and an estimated readership of 1.4 Million. The digital component is distributed nationally, through a vast social media strategy, and across a network of top news sites and partner outlets. To explore the digital version of the campaign, click here. 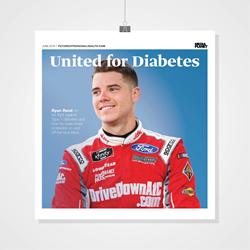 Long-time Diabetes fighter Ryan Reed takes the cover of the print publication. Through an exclusive interview on the interior, Ryan reveals that when he first got diagnosed with diabetes, his future as an athlete was hopeless. “I was told I would never race again and that stayed with me” says Reed. “It potentially robs you of something in your life.” Since then, he has fought tirelessly to raise awareness and not let Diabetes slow him down. His contributions include inspiring people with diabetes about how to manage the disease on a busy schedule, join Beyond Type 1 which bands together numerous celebrities and influences that have T1D, and advocating for research on a potential cure. Now, more than a decade later, Reed says, “Today, nutrition is a huge part of my life.” He also highlights his new initiative, DriveDownA1c, encouraging everyone to get involved and be a part of the fight. This campaign was made possible with the support of the American Diabetes Association, Diabetes Research Institute Foundation, Diabetes Care and education, Academy of Nutrition and Dietetics, Defeat Diabetes Foundation, American Council on Exercise, Medtronic, 3M, and Intelligent Retinal Imaging Systems.